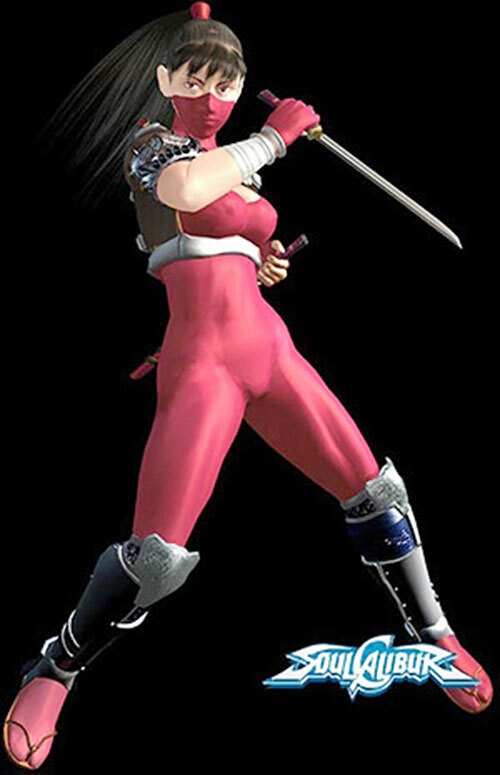 Soul Calibur (ソウルキャリバ) was one of the big-brand console fighting games of the 1990s. New games in the series have been getting released ever since. 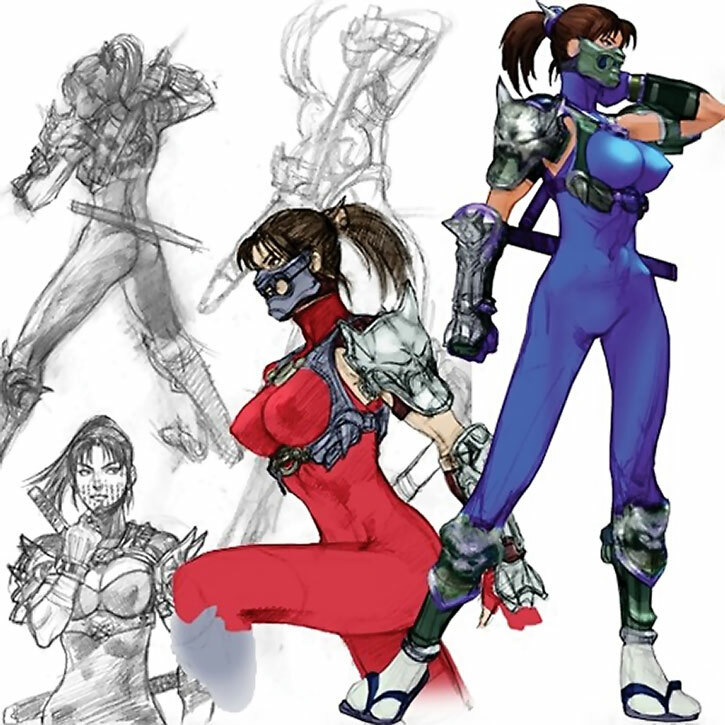 Taki is one of the playable characters, and among the more famous ones at that. 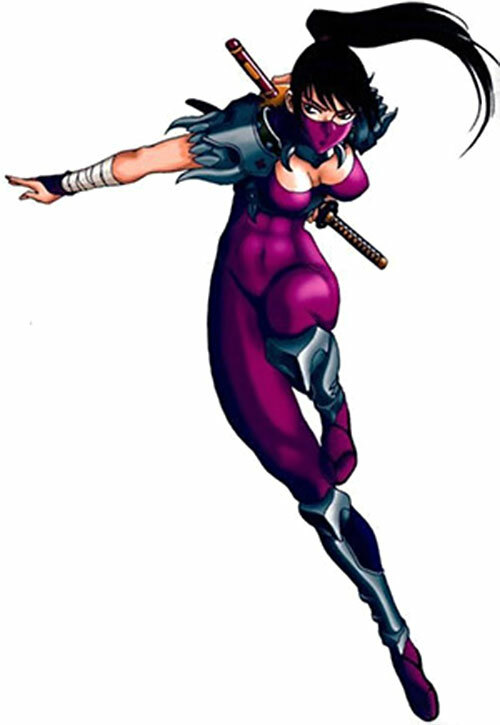 She’s not just a ninja, or even just a mystical ninja – she’s a demon slaying mystical ninja. Who makes her own equipment. Other Aliases: Shadow Huntress of Demons, Underground Hunter. Known Relatives: Unnamed family (deceased), Toki (adopted father, deceased by her own hand). Group Affiliation: Formerly of the Fu-ma Clan, now a nuke-nin (runaway ninja). Height: 5’7” Weight: 117 lbs. Taki is a seasoned demon hunter and ninja. She has managed to slay/seal a lot of powerful demons as well as stay one step ahead of the Fu-ma Clan who have hunted her for years. 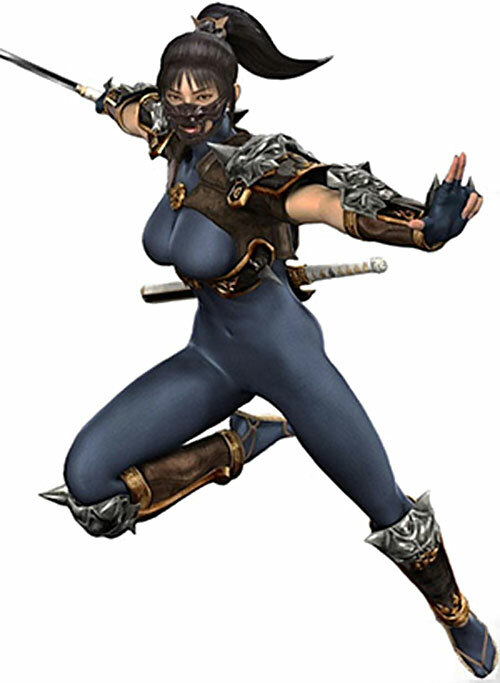 She’s pretty skilled in melee combat and was able to beat Cervantes while he was possessed by the Soul Calibur. She’s also extremely fast and highly acrobatic. 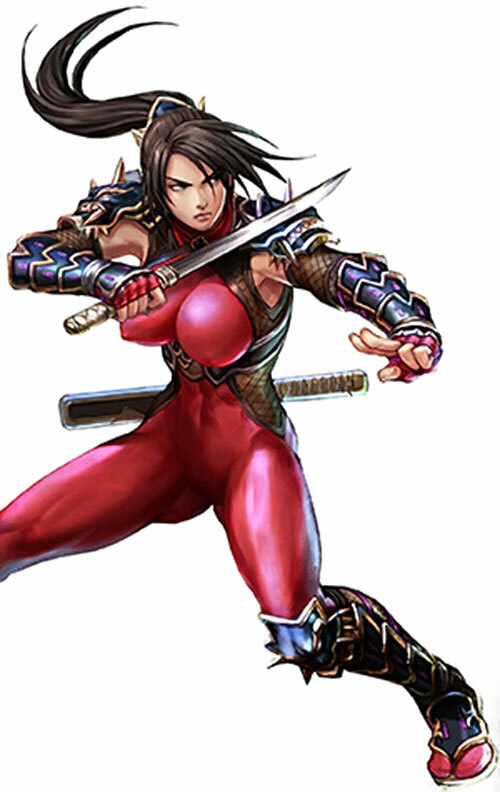 Taki is a very well proportioned (read comic book style woman’s figure) Japanese woman. 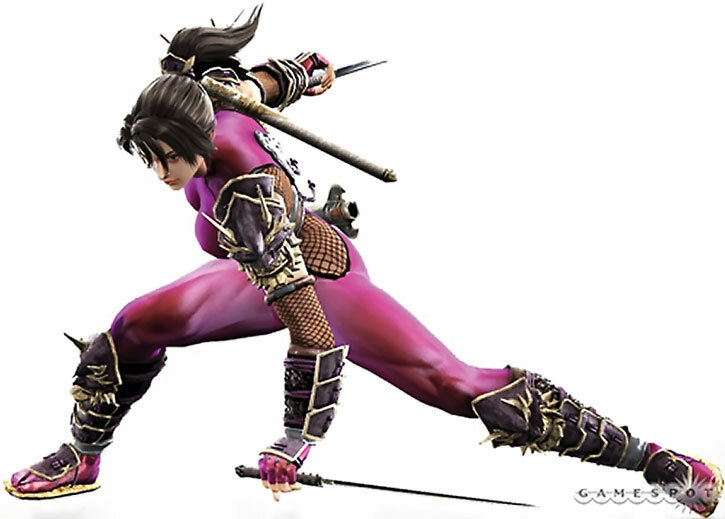 She typically wears her trademark skintight red ninja outfit (I didn’t know they had spandex in the 17th Century!) and light body armor. She also has a mask to hide her identity, ninja style. Her hair is long and often bound into a ponytail. For some reason in quite a few of her outfits she wears a very short shirt and a thong underneath. One cannot help but wonder why. 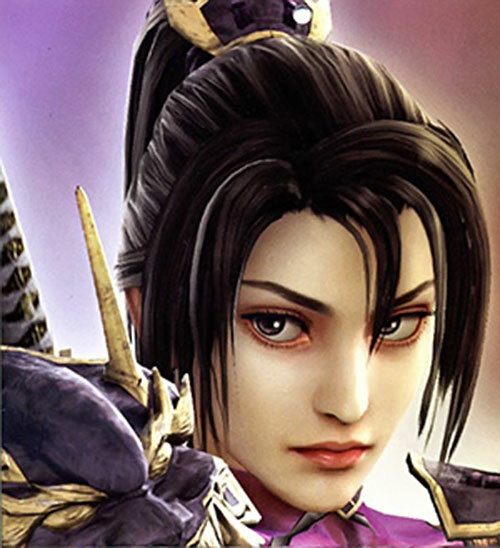 Taki is a kind and passionate woman who cares deeply about slaying demons before they can harm mankind. She left her ninja clan. As a result she was marked for death and hunted for years before eventually being forced to kill her former master/adopted father just to do the right thing. She is also quite passionate about her work as a blacksmith. Taki cares deeply for the weapons she forged. She also seemed like a bit of an adrenaline junkie at times. For instance she was constantly tempted to use and master the evil power of the Mekki-Maru despite the risk, but that could’ve just been the evil blade tempting her. Iron Nerves, Languages (Japanese), Lightning Reflexes, Schtick (Fast draw). Enemy (Fu-ma Clan), SIA (slaying/sealing demons). Rekki-Maru [BODY 04, EV 04, R#02]. 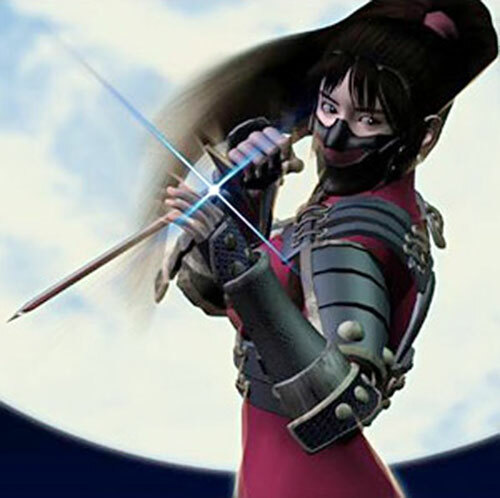 Taki made her own weapons and protective gear, partly out of need and partly as a hobby. She created her favorite possession, Rekki-Maru, by incorporating mystical powers into the blade. For Taki, it proved time and time again to be a valuable partner in demon-slaying. Rekki-Maru is the higher sword on Taki’s back. 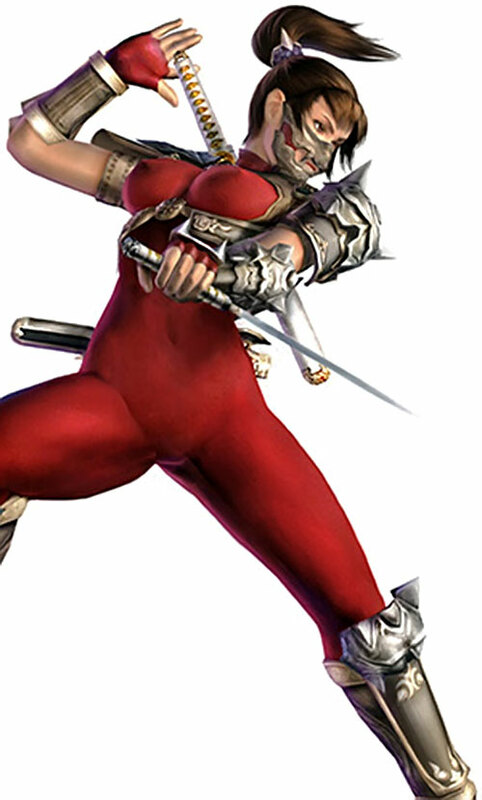 It was Taki’s only weapon in Soul Blade. It was broken during the fight with Cervantes, but she fixed it. Mekki-Maru [BODY 05, EV 05, Claws (ML): 05, R#02, Bonuses & Limitations: Claws automatically attack if she uses it against anything with mystical attributes. This weapon is dangerous to use and it drains one HP for every round it’s out of its sealed sheath. If it takes the wielder down to 0 HP then the Claws begin to attack the wielder and if it reduces the wielder spirit to 0 then it possesses them.]. Mekki-Maru was a sword cloaked in mystery. It was given to her by Hachibei, a former ninja of the Fu-Ma clan. Ever since it was fused with a fragment of Soul Edge that was found in Sophitia’s body, it emanated an evil aura whenever it was drawn from its protective scabbard. Because of this, even Taki handled it carefully. In any event, surely she would learn to subjugate into obedience this sword of unknown potential. Mekki-Maru is the lower sword on Taki’s back. Concealed chainmail [BODY 04, Invulnerability: 04, Skin armor: 01, Limitation: Invulnerability and Skin armor only vs slashing and piercing weapons ; Real Armour]. Seal [Dimensional Travel (Only to Banish demons): 04, CT: 0. Taki uses this one somewhat frequently against lesser demons.]. Ward [Magic Shield: 04, Taki used this in CG intro of Soul Calibur 3 against her fight with Ivy to protect herself from the magic blasts Ivy had launched at her.]. Taki is a fairly skilled occultist and may very well have other rituals related to demon slaying, but they are never actually shown. Also note that she does not have the dual wielding Schtick as she very rarely uses both blades at once and even then the effects don’t seem impressive enough to warrant granting her the Schtick.